France's foreign intelligence service learned as early as January 2001 that al Qaeda was preparing a hijacking plot likely to involve a U.S. airplane, former intelligence officials said Monday, confirming a report that also said the CIA received the warning. The Sept. 11 commission's report on the four hijacked flights has detailed repeated warnings about al Qaeda and its desire to attack airlines in the months before Sept. 11, 2001. In a version declassified last September, the report shows that the Federal Aviation Administration's intelligence unit received "nearly 200 pieces of threat-related information daily from U.S. intelligence agencies, particularly the FBI, CIA, and State Department." 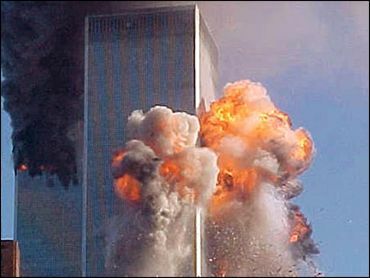 George Little, a CIA spokesman, said the agency does not generally comment on reports of information from foreign partners, but noted that the Le Monde story "merely repeats what the U.S. government knew and reported before Sept. 11 — that al Qaeda was interested in airliner plots, especially hijackings," Little said. "The article does not suggest that U.S. or foreign officials had advance knowledge of the details surrounding the Sept. 11 plot. Had the details been known, the U.S. government would have acted on them." The French warning, part of which was published in Le Monde, detailed initial rumblings about the plot. In early 2000 in Kabul, Afghanistan, bin Laden met with Taliban leaders and members of armed groups from Chechnya and discussed the possibility of hijacking a plane that would take off from Frankfurt, Germany, the note said, citing Uzbek intelligence. The note listed potential targets: American Airlines, Delta Airlines, Continental Airlines, United Airlines, Air France and Lufthansa. The list also included a mention of "US Aero," but it was unclear exactly what that referred to. Two of the airlines, United and American, were targeted months later on Sept. 11. Lorenzi said details of the threat would certainly have been passed along to the CIA, though he was unable to specifically confirm that they had been. "That's the kind of information concerning a friendly country that we communicate," he said. "If you don't do it, it's an error." He also stressed that officials could not say whether the plot they outlined in January 2001 was an early warning about the attacks to come in September. At the time, Lorenzi said, officials had heard echoes only about a standard hijacking — they had no idea al Qaeda planned to slam planes into buildings, let alone the World Trade Center and the Pentagon. Uzbek officials apparently tipped off the French about the plot. Alain Chouet, a former top anti-terrorism official within the DGSE, said that an Afghan warlord from the Uzbek community who was fighting the Taliban at the time had sent men to infiltrate al Qaeda camps — and their information was passed down the chain to Western intelligence officials. Confirming information in Le Monde, Chouet said such intelligence was likely checked out before it was put into a note. He also said that to the best of his knowledge, "all identified threats, even indirect and minimal ones, were passed in both directions" between the CIA and the CGSE. The 9/11 commission said that, as 2001 began, the CIA started receiving "frequent but fragmentary" threat reports. Among other warnings, the intelligence community sent out a March 2001 terror threat advisory about a heightened threat of Sunni extremist attacks against U.S. facilities, personnel and other interests. During that investigation, then-CIA Director George Tenet told the commission that "the system was blinking red."